Want more info on caring for your new finch? Visit the Care Section for info on diet, illness, and cleaning routines. Below is a letter that originally appeared on the Finch Forum by Michael, the Purist, one the forum's regular-posting experts (reprinted here with permission). I've always liked this posting because it states the basics in a simple, sweet, and straightforward manner for anyone interested in becoming a newbie finch owner. 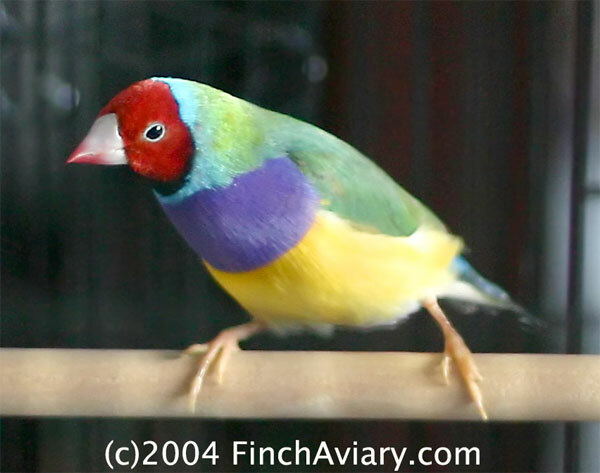 There is a lot of information out there regarding the care and breeding of various finch species, which is very good. But it can also look daunting to someone who wants to get their feet wet. If you can handle challenge of meeting the basic needs stated in this letter, you can handle the responsibility of owning your first pair of finches. The rest will come in time. Below is a letter that your finch asked me to pass along to you [hey it's a slow day on the forum!] It wasn't easy for him to type with those little toes, so I helped him out. Hope you enjoy it. Thank you for having me as an addition to your family. Obviously I must have seemed special to you for you to want to bring me home. But before we get too far along, let me tell you what will be required to maintain me and keep me healthy. First of all, I need the biggest cage you can provide for me. It should be wider than high because we finches like to fly back and forth. Place my home in an appropriate place out of drafts and heavy foot traffic. We get a little nervous if we're in too busy of a location. And maybe if I'm really lucky, I'll get to live in an aviary! Now for my dietary needs. It's really not too complicated. A high-quality finch seed, some egg-food, fresh, clean water and some dark leafy greens will satisfy my discriminating palate. A cuttlebone, mineral grit and some crushed egg shells will round out the picture. Vitamin supplements wouldn't hurt either. Also, some of us like some live, squirmy things every now and again -- I think you folks call them mealworms. Whenever possible, most of us like to have access to bath water. It keeps our feathers and skin in good condition. Some of us may want to start a family. So when that time comes, we're going to need a nest and something to line it with. Most of us aren't that fussy. A wicker basket or nest box will suit us just fine. One more thing, when we finally get 'down to business' please give us the privacy and courtesy you would expect as if we were talking about you. Surprisingly as this may seem, our families have been doing this for thousands of years and most of us don't need help. But if we do, please do it as discreetly and quickly as possible. Sometimes that which appears unusual to you is very normal in our world. The harsh reality is that all of our babies don't make it. Sometimes we toss them because we know there is something wrong with them or we don't have adequate food to raise them to become adults. And many times it's just because of overzealous grandparents that constantly monitor us every 78.3 seconds. After a while it causes us to become unstable and we sometimes do things that normally would not be part of raising our family. Give us some space and we will bless you with future feathered friends. And if keeping all of us isn't possible, we understand. Please find us appropriate and caring homes. And on the down side, sometimes we get sick. When this happens please help us by having the good sense to find out what will help us. Maybe that means having to have some medications on hand at home before this happens. And if that isn't possible, take us to a doctor that can tell you what to do to make us better. There may be some things that I've forgotten to tell you, but we'll discover that together as we go. Well, I've taken up enough of your time. After all, you've got to get started on making that egg-food! Take good care of me, respect my needs and I will do my best to make you proud to say that you are the proud guardian of a finch.